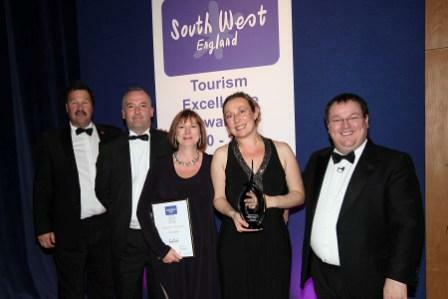 Cornish businesses featured heavily in last night’s South West Tourism Awards, with The Scarlet taking the coveted Winner of Winners trophy. In total, seven of the 17 gold awards went to Cornwall, with The Scarlet also taking the Small Hotel of the Year along with the award for Sustainable Tourism, which it won in conjunction with the Bedruthan Steps. Further Cornish businesses celebrating at the Riviera International Conference Centre in Torquay, were the Eden Project, Porthminster Beach Café, Mother Ivey’s Bay Holiday Park and the Gourmet Surf Experience by Global Boarders and Ben’s Cornish Kitchen who all won gold in their respective categories. Additionally, Cornwall also claimed three silver, one bronze and nine finalist placements on the winners roll. This year’s awards event was presented by journalist and broadcaster Declan Curry, best known for presenting the business on BBC Breakfast and hosting BBC’s Working Lunch business programme.